A few months back, our friends asked if we would be interested in hiking the Three Peaks with them as part of a charity event. The Brit and I both love to try new things, so we both happily agreed — he knew what it was and I had no clue aside from it was a hike. 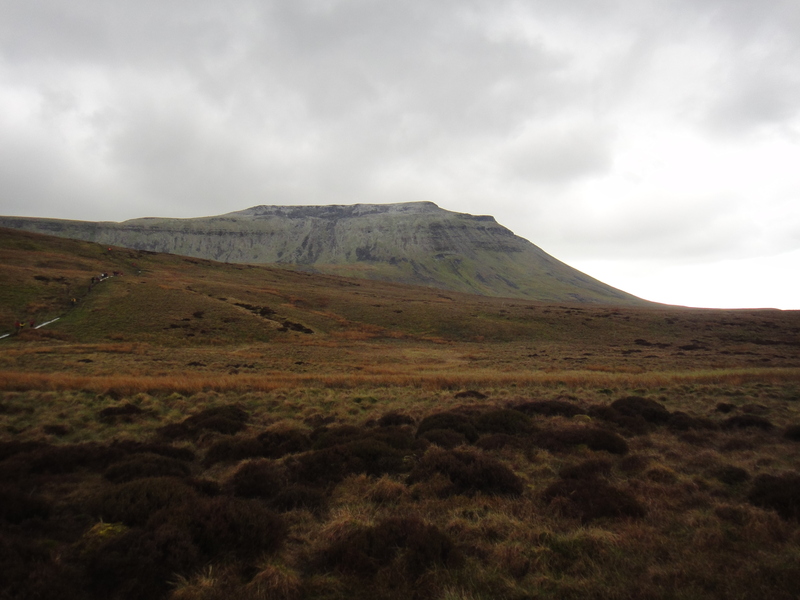 I went about googling Three Peaks and came across the National Three Peaks, which involves hiking the highest peaks in England, Scotland and Wales…in 24 hours. I consider myself to be in fairly good shape, but I wasn’t sure if I was ready for this. Thankfully, the Brit was sitting beside me when I came upon this and he righted me. 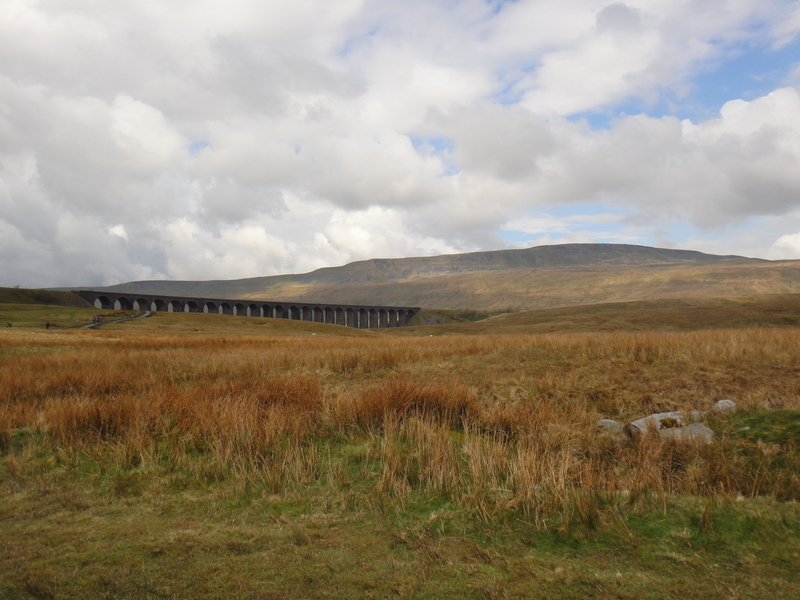 We actually would be completing the Yorkshire Three Peaks, which including hiking the peaks of Pen-y-Ghent, Whernside, and Ingleborough in 12 hours. In total, it would be a roughly 25-mile hike. As the website shows, you can pay to have a guide lead you on certain days, but we did it on our own with a map (that I didn’t understood)! So, the night before the hike, we stayed in an old farmhouse with rooms that the family rented out. I do not remember the name of it and would not really recommend it, so for that reason I am not going to try to figure out what it was called. The good thing about the location of the farmhouse was how convenient it was to get the the village of Pen-y-Ghent in the morning as we were set to begin at 7 AM. 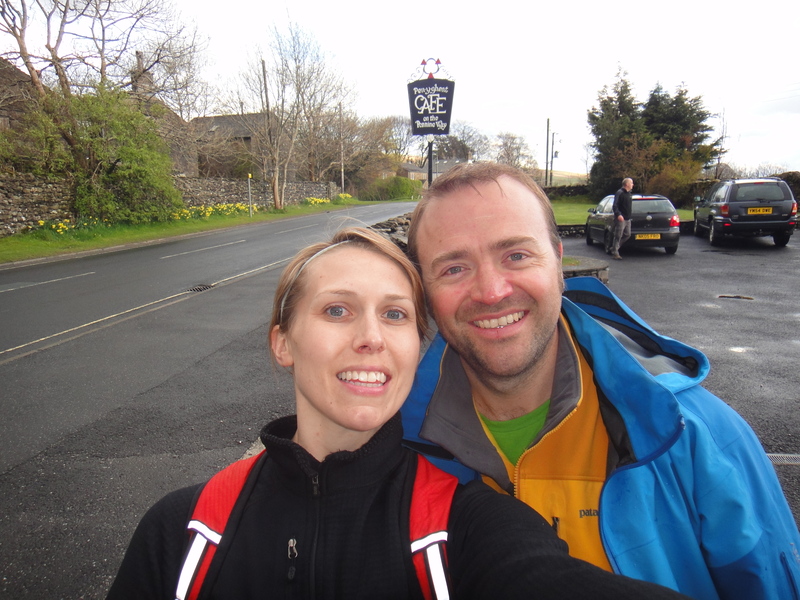 The morning of the 21st of April, we got to the village and clocked in at the Pen-y-Ghent Cafe so we could have record of our official time, as the hike is a loop and you finish by checking back in at the cafe. Off we went to tackle the first of the peaks and we were all in good spirits as we made it to the top in about an hour. 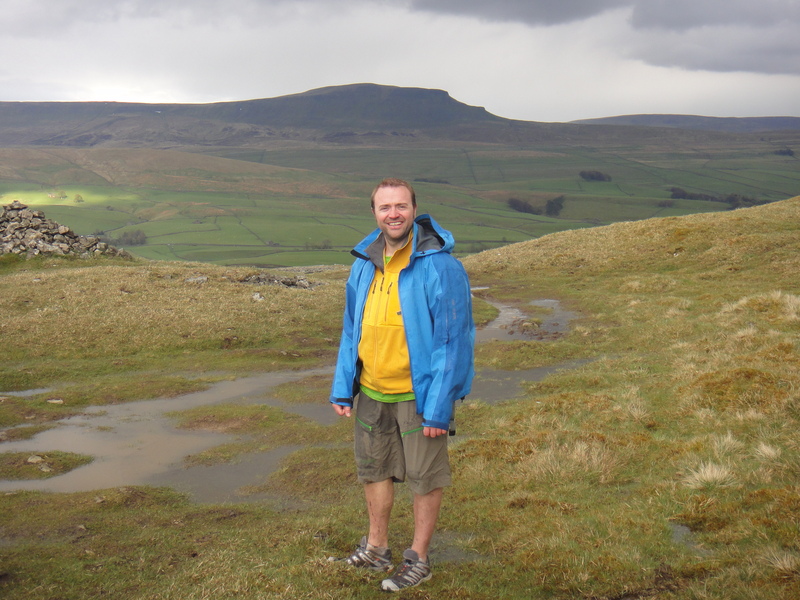 At the top of Peak 1, Pen-y-Ghent! 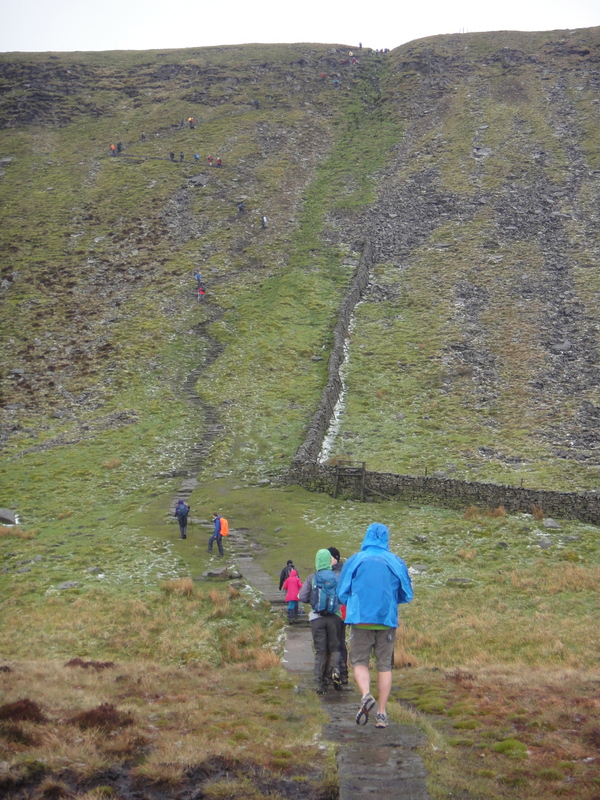 When you reach the top of Pen-y-Ghent, you think this will be a breeze, but upon starting the descent you realize just how far it is between each peak. I have no idea the exact mileage between them, but I’m guessing 6-8 miles. Some of the hiking, mostly the ascents and immediate descents, is on rough trails, but a lot of the in-between-peak-hiking is through fields. And, on the day we were hiking, the fields had become extremely marsh-like. We often found ourselves taking the long way around just to avoid sinking knee-deep into mud and water. It was definitely an adventure and a bit of a puzzle trying to find the best route! The crazy fog at the top of the peak. Our friends crossing the stream. 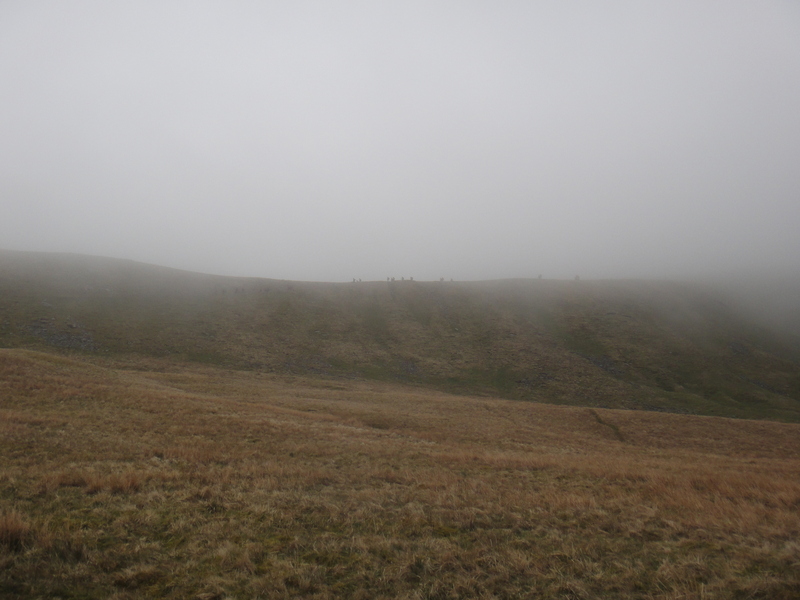 We were lucky in that the weather held up and was mainly overcast until we nearly had reached the top of the second peak. At that point, it began to alternate between sleet and rain for quite awhile. We all pulled our rain gear out and kept it on for most of the rest of the day. 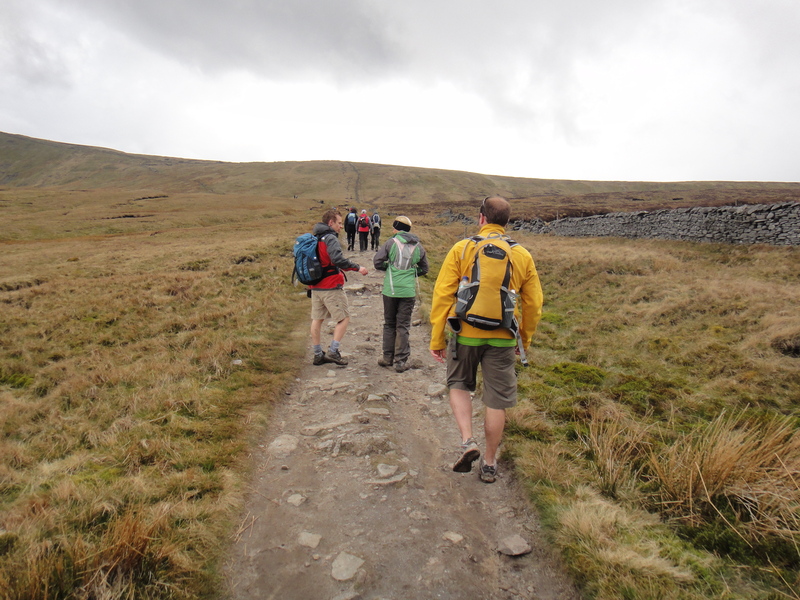 Nearly at the second peak, Whernside. Enjoying the view hiking up Whernside. Can you guess the Brit’s favorite color? 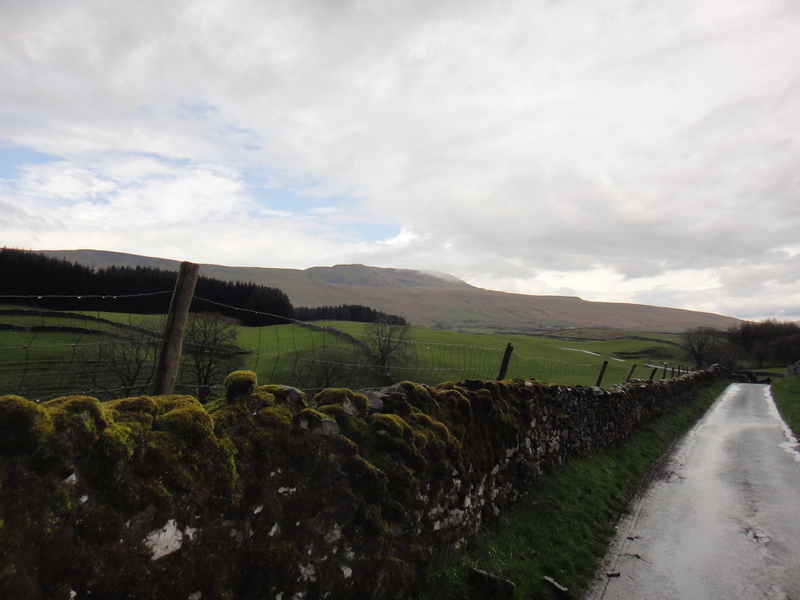 Looking back at Whernside…enjoying a brief break from the wet weather! Between the second and third peak, we came upon a pub and the four of us were in need of some drying out (and a real toilet), so we made a pit stop. I enjoyed a pint of Diet Coke and a cup of tea (yes, this time I participated!) while sitting in front of the fireplace. It was nice to take a little break. We were soon off again as we only had one more peak to conquer. 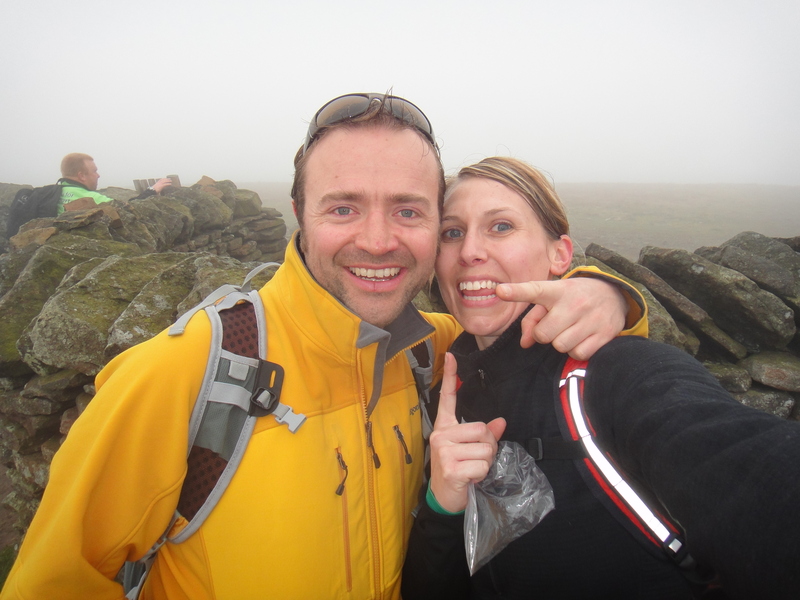 To me, the third peak, Ingleborough, was the toughest. The path up it was steep and it was hailing hard. The Brit had shorts on and the hail was pelting his legs. A couple pieces hit me in the face and stung like mad. All in a day’s fun, right?! You can see some of the hail settling on Ingleborough. Fun times ahead! 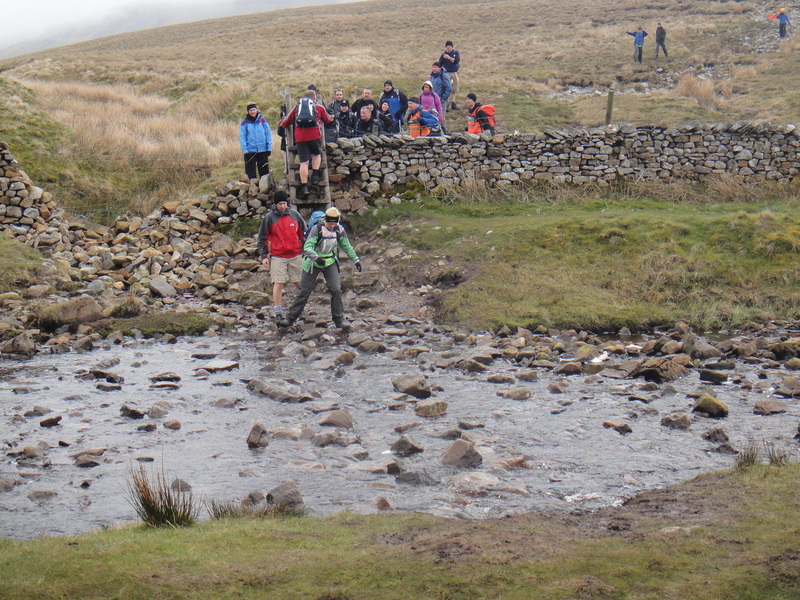 Starting the trek up Ingleborough. It was like we were on a different planet at the top. 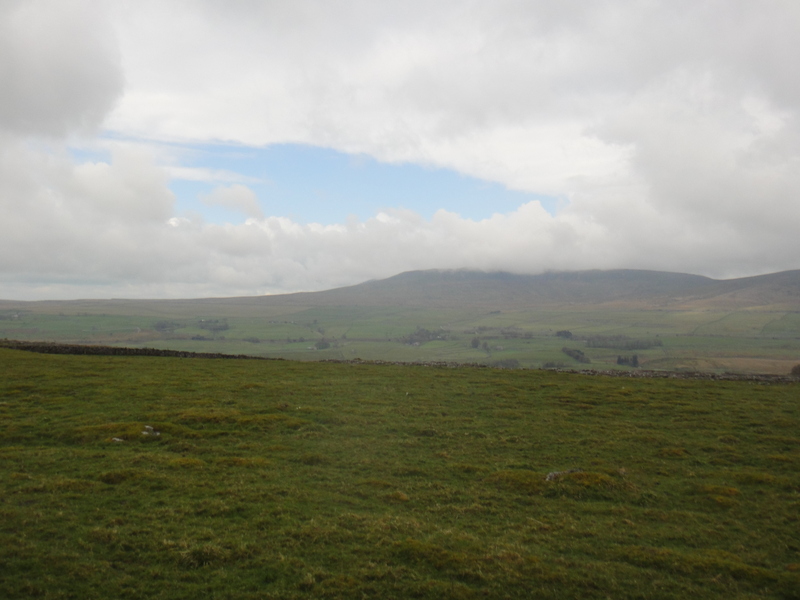 When we finally reached the top of Ingleborough, it was a relief, but we had no idea how far we had to go until we were back in the village of Pen-y-Ghent, so the two of us kept guessing until we came across a sign that said it was 1.5 miles away. We picked up the pace a little to try to make the 12-hour mark so we could say we actually completed the ‘challenge’! At this point, I could not wait to walk on an even surface. My feet just wanted a flat footpath that wasn’t wet, muddy, or rocky. I was so grateful when we got to the village, but my feet and legs almost didn’t know what to do on an even surface. It was such an odd sensation. Regardless, we were happy to be done and happy to have tried something new! 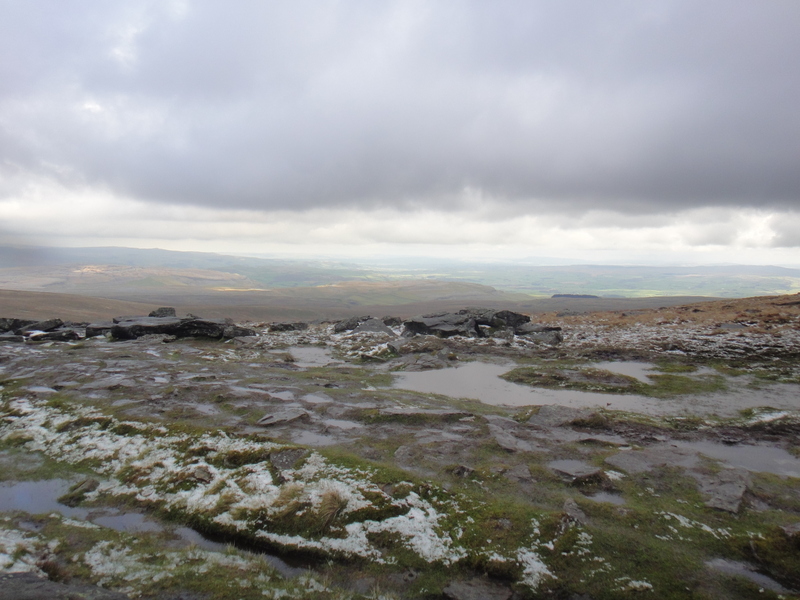 We had completed the Yorkshire Three Peaks in less than 12 hours! Back at the cafe where we started…tired and ready for a pint or two! 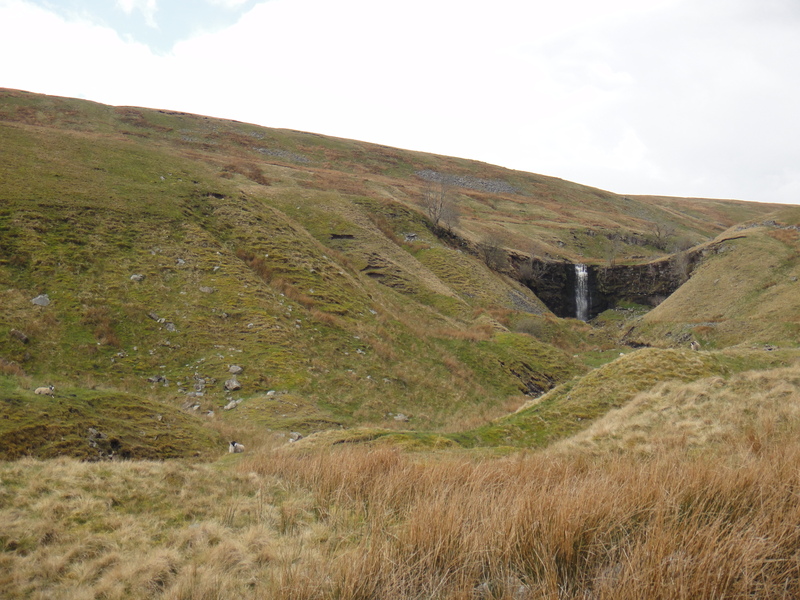 So, would I recommend the Yorkshire Three Peaks to others? Most definitely! There are a few things to consider though. Because you are hiking for hours and for miles, you will go through moments when you are excited and loving life and others when you are annoyed and frustrated. Also, I would recommend that you are in a healthy physical state because it is trying at times and it is not an easy walking hike — your heart rate will rise and you will sweat. You will need to carry sufficient drinks and food with you because, although there are a few places as I mentioned that sell provisions, I was rarely hungry when we passed the food trucks and the pub, so it was good to have our own supply. And lastly, you should have proper hiking shoes or boots that are waterproof and sturdier than your every day trainers (sneakers) — you may laugh, but we saw people out there with trainers on! Truthfully, it was an incredible experience and I would do it again (good thing as the Brit is already planning to try to beat our time)! I’m so glad you posted this- I’m showing it to Paul now! Sounds like a doozy, both of a hike and a day, but those make for the best feeling of accomplishment!! Wow!